I have read the September Report and these are things that I found interesting. 1) The report is dated November 12, 2014. Normally the September reports are delayed several months to verify information. So this one is extremely early. 2) Ridership in September appears to be slightly up driven by Northeast Corridor Traffic. Long Distance Trains suffered. For the year, the total ridership was 30,921,274 or 685,251 less than the "actual" amount shown last year, but still ahead of the adjusted amount so a new annual record could be claimed. 3) Amtrak's operating ratio declined in September so its fare box recovery for the entire year was 97% slightly less than the previous 11 months average. For the year, Amtrak was $143.6 million better than budget with a total GAAP Loss of $999.3 million. This was an improvement of $193.8 million over FY 2013. Net Interest was $36.4 million less than budget. For the full year, Amtrak has a cash loss of $188.7 million which is over $200 million less than the operating portion of its appropriations. This was done by an increase in revenues and a decrease in operating expenses. One key element in the decrease in operating expense was the sharp decrease or elimination of performance bonuses paid to the freight railroads for on time performances. Needless to say with on time performance slightly improved in October, these "savings" will not likely repeat themselves, and in the meantime the huge meltdown in on time performance may severely impact national train ridership. Food and Beverage Recovery ended up at 52.2%. In addition two other product lines Maple Leaf and Adirondack covered all expenses except their share of OPEBs and Amtrak Inspector General. 6) Long Term Debt was significantly revised during the month. Mortgages were increased $138.536 million and the RIFF loan was increased by capitalized interest in the amount of $0.769 million. On the other hand Capital Leases were reduced by $225.921 million and Equipment and other debt went down by $6.019 million. The result was a reduction in long term debt by $92.635 million. Current Maturities also were reduced by $20.138 million so that total debt saw a shrinkage of $112.773 million. Amtrak total debt is now $1.273 billion. 7. The Chief Engineer's report shows 16 additional turnouts were installed in September along with 4 Bridge Decks retimbered, 2.4 miles of Electric Catenary Renewed, 1 additional Transformer replaced, and 3.3 miles of new Signal Cable laid. For the entire year 41 turnouts were installed, 6 Bridge Decks retimbered, 1 Bridge Deck converted to ballast, 14.7 miles of Catenary renewed, 3 new transformers put in place, and 61.9 miles of Signal Cable laid (most of which was between New Haven and Springfield). 9) In FY2014 total capital spending other than debt servicing was $1.173 billion of which Gateway was $125.473 million, Acquisitions was $6.928 million, and ADA expenditures was $24.5 million. 10) Employment at Amtrak in September increased by 76 to 20,321 employees. 11) Congress is back in session. The lame duck session is expected to pass an omnibus spending package. Amtrak is likely to get what it got in FY2014 though adjustments could take place. 12) All HHP-8 electric locomotives have now been pulled from service. (Not sure if some may be used for the extra trains in Thanksgiving period). 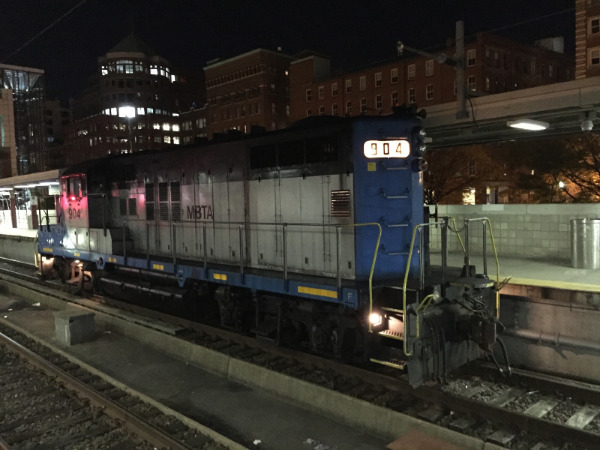 About 26 ACS-64 Electric Locomotives are now on the Northeast Corridor, most of whom are now in service. On time performance is slightly better but varies from day to day. NEC Futures has a set of alternatives, but without money to construct any projects, the alternatives are meaningless.